Tom Stewart and Michael Charley are recent college grads who love salsa and great design. They invented a bowl that solves the classic salsa lover’s conundrum: how to avoid wasting precious chunks of diced vegetables and herbs that fall off the chip before reaching the dipper’s mouth. Their creation, dubbed the Salsabol, is a ceramic bowl with a strategically engineered lip that’s designed to push the dip onto your chip for a more stable scoop. When you go in for a dip, you can use the edge to get a perfectly loaded scoop -- not too stingy, not too generous. You’ll enjoy every bite, and you won’t miss the traces of spilled salsa on your tablecloth. Besides being functional, the Salsabol is beautiful. The curved form -- in sunburst yellow, matador red or mojito green -- is graceful and modern. It’ll get your guests’ attention and keep them coming back for more. Hey Daily Grommet! We're Tom and Michael, inventors of the serendipitously scooptacular Salsabol! We're both excited and grateful to have the opportunity to tell you about our product and talk about the latest innovation in modern-day scoop technology. 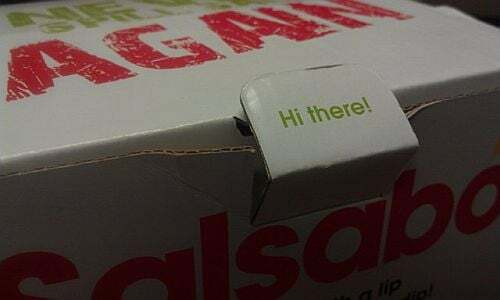 The Salsabol started off as a side project in August 2009 and has since grown into a small business with steep learning curves, lots of salsa intake, and a great story to tell. Michael studied economics and Tom architecture, so we work together to design and implement every part of our business. All of the packaging, website, and of course, product design, we do ourselves, along with all of the logistics of manufacturing and distribution. Between us, these are all things we knew (and still know) admittedly little about, so our daily routine seems to always involve learning something new under the intense conditions of Salsabol pressure. For our customers, the Salsabol represents a long-awaited and definitive end to messy dip spills. For us, it means that and a lot more, as it has also been our vehicle for entering the professional design and business world. We love us some salsa and we love us some bols, but we also love the story that the Salsabol has written in our personal development after college. Which is another reason why we're excited to be here today to talk with you guys. Please do get in touch! We'll gladly touch on any and all topics, even skiing, or surfing, or hiking, or anything outdoors, which is what we try to do every waking moment when we're not working on the bol! I am suddenly craving Mexican. The chunks in the Salsa look so fresh and tasty keeping as much on the chip would be my goal, too! The first question I always ask myself with any kitchen non-essential is, "Is there room in the cupboard for it?" I'd make room for the salsabol! Love it! And it's not like you couldn't use the cool-shaped vessel for other things, thus further justifying its space on the shelf! @Laurie McCabe: Hi Laurie! We get this question a lot as well: "but how will it stack in the cupboard?" First off, that's assuming the Salsabol even ends up in your cupboard--we almost always have ours on the table since we're constantly snacking! ...but take it from us, who have a lot (like a LOT) of Salsabols in the kitchen: they stack fantastically! You can put them on top of a serving plate or larger bowl in the cupboard and stack them sky high! I wanted to buy the red and green. @Donna Thomson: Thanks for letting us know that you couldn't order the green. The problem is fixed now and you can order it. Enjoy! 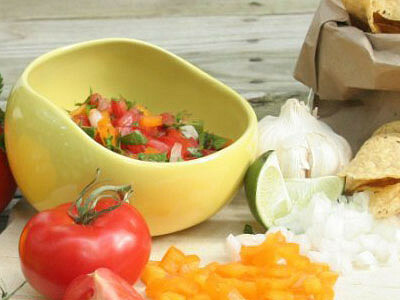 @Donna Thomson: You are going to love your bowls. Tom and Michael seem to have thought of everything with these bowls. They've got the attention to detail and a sense of humor! Salsa and a side order of fun. What a GREAT idea! Too bad they aren't made of plastic. It would make a perfect cereal bowl for my 2 year old granddaughter who is learning to master the spoon....any thoughts about plastic?? I love these! Great colors and shape. One of those "so simple, wish i had thought of that ideas"! I have received both of my Salsabols and they work GREAT! No more struggling to keep the salsa on the chip :) I was disappointed that they are not made in the USA, but, instead, made in China. Surely ceramics are manufactured somewhere in America! @Donna Thomson: Thanks for coming back to share with us, Donna! Glad you love how well the Salsabols work, we do too. We will forward your feedback to Tom and Michael about how important the place of manufacture is to you and many in our community. So glad to hear you've got your Salsabols and that you're pleased with their scooping performance! As for the manufacturing location, we understand the disappointment that they are not made in the USA. We are also disappointed that they are not! We searched and searched for a domestic custom ceramic manufacturer with the capacity to produce Salsabols and one simply does not exist. Luckily, we did find a partner in China and we feel they've made a great product for us--and a difficult one at that, as the Salsabols are handmade and quite challenging to make. We're a young company with an entrepreneurial spirit and a deep appreciation for the opportunities we have as American entrepreneurs. We've always been on the lookout for a US producer and will remain so, but we just couldn't wait to start saving salsa everywhere so we went with what we felt was best. Thanks again for your thoughts and please enjoy those Salsabols! I can appreciate most of the things you put on the website, but this seems a bit silly. I look forward to the clever and really unique stuff and hope it remains within a decent price point. Thanks. @JoAnna Cousins: Thanks for your feedback, it is truly important to us. @Melinda: Definitely a fun idea! This bowl is in the "Uncommon Goods" catalog for $16. The same size. Why such a price difference? @julia koenig: We are selling them as a set of two. Tom Stewart and Michael Charley are recent college grads who love salsa and great design. 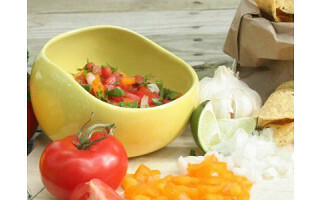 They invented a bowl that solves the classic salsa lover’s conundrum: how to avoid wasting precious chunks of diced vegetables and herbs that fall off the chip before reaching the dipper’s mouth. Their creation, dubbed the Salsabol, is a ceramic bowl with a strategically engineered lip that’s designed to push the dip onto your chip for a more stable scoop. When you go in for a dip, you can use the edge to get a perfectly loaded scoop -- not too stingy, not too generous. You’ll enjoy every bite, and you won’t miss the traces of spilled salsa on your tablecloth.